Most drugs are molecules, but most molecules are not drugs. Every year, millions of new molecules are prepared, but only a very small fraction of these are ever considered as possible drug candidates. A chemical compound must possess certain characteristics if it is to cross the hurdle from being an organic molecule to becoming a drug molecule. Medicinal chemistry is the applied science that is focused on the design (or discovery) of new chemical entities (NCEs) and their optimization and development as useful drug molecules for the treatment of disease processes. What is Drug molecule or Drug like molecule? A molecule is the smallest particle of a substance that retains the chemical identity of that substance; it is composed of two or more atoms held together by chemical bonds (i.e., shared electron pairs). Although molecules are highly variable in terms of structure, they may be organized into families on the basis of certain groupings of atoms called functional groups. A functional group is an assembly or cluster of atoms that generally reacts in the same way, regardless of the molecule in which it is located; for example, the carboxylic acid functional group (-COOH) generally imparts the property of acidity to any molecule in which it is inserted. It is the presence of functional groups that determines the chemical and physical properties of a given family of molecules. A functional group is a centre of reactivity in a molecule. Physico-chemical properties are crucial to the pharmaceutical and pharmacokinetic phases of drug action; the other three properties are fundamental to the pharmacodynamic interaction of the drug with its receptor. Physicochemical properties reflect the solubility and absorption characteristics of the drug and its ability to cross barriers, such as the blood–brain barrier, on its way toward the receptor. 1. Partition Coefficients- The partition coefficient of a drug is defined as the equilibrium constant of drug concentrations (symbolized by the square brackets) in the two phases. Since partition coefficients are difficult to measure in living systems, they are usually determined in-vitro, using n-octanol as a model of the lipid phase and an aqueous phosphate buffer at pH 7.4 as a model of the water phase. This permits standardized measurements of partition coefficients. Because it is a ratio, P is dimensionless. P is also an additive property of a molecule, since each functional group helps determine the polarity and therefore the lipophilic or hydrophilic character of the molecule. These substituent contributions are widely utilized in quantitative structure-activity studies. Partition coefficients thoroughly influence drug transport characteristics during the pharmacokinetic phase; that is, partition coefficients affect the way drugs reach the site of action from the site of administration (e.g., injection site, gastrointestinal tract). Drugs are usually distributed by the blood, but must also penetrate and traverse many barriers before reaching the site of action. Hence, the partition coefficient (which reflects a drug’s ability to be soluble in both aqueous and lipid phases) will determine what tissues a given compound can reach. On the one hand, extremely water-soluble drugs may be unable to cross lipid barriers (e.g., the blood–brain barrier) and gain access to organs rich in lipids, such as the brain and other neuronal tissues. As is apparent, partition coefficients (quantified by the logP value) are important considerations in drug design. To be successful during the pharmacokinetic phase of drug action, the drug molecule should demonstrate the right combination of lipid solubility and water solubility. This property is best represented by the logP value. If the logP value is too low, the compound is too water soluble and thus will be unable to penetrate lipid barriers and will be excreted too rapidly; if the logP value is too high, the compound is too lipid soluble and will be undesirably sequestered in fat layers. (iii) serve as the boundaries of cells and many tissue compartments. 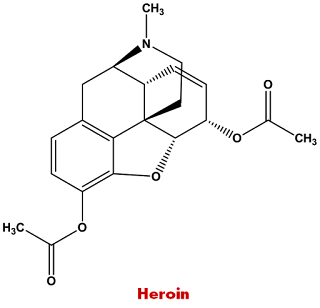 In addition, many drug receptors are bound to membranes. It may be defined as the rate and extent of absorption. Bioavailability means the rate and extent to which the active ingredient or active moiety is absorbed from a drug product and becomes available at the site of action. For drug products that are not intended to be absorbed into the bloodstream, bioavailability may be assessed by measurements intended to reflect the rate and extent to which the active ingredient or active moiety becomes available at the site of action. Clinical studies are useful in determining the safety and efficacy of drug products. Bioavailability studies are used to define the effect of changes in the physicochemical properties of the drug substance and the effect of the drug product (dosage form) on the pharmacokinetics of the drug. Bioequivalence studies are used to compare the bioavailability of the same drug (same salt or ester) from various drug products. Bioavailability and bioequivalence can also be considered as performance measures of the drug product in-vivo. If the drug products are bioequivalent and therapeutically equivalent (as defined above), then the clinical efficacy and the safety profile of these drug products are assumed to be similar and may be substituted for each other. Dissolution refers to the process by which a solid phase (e.g., a tablet or powder) goes into a solution phase such as water. In essence, when a drug “dissolves,” solid particles separate and mix molecule by molecule with the liquid and appear to become part of that liquid. When a tablet or other solid drug form is introduced into a beaker of water or into the gastrointestinal tract, the drug begins to pass into solution from the intact solid. Unless the tablet is a contiguous polymeric device, the solid matrix also disintegrates into granules, and these granules deaggregate in turn into fine particles. 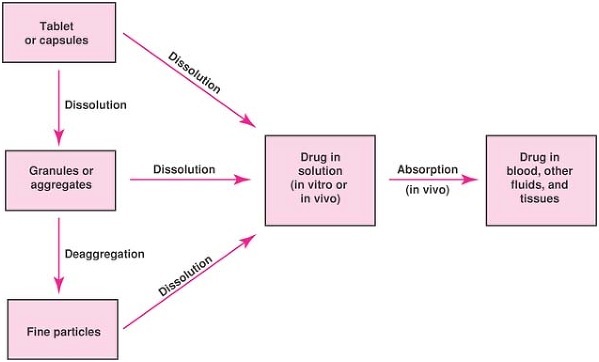 Disintegration, deaggregation, and dissolution may occur simultaneously with the release of a drug from its delivery form. 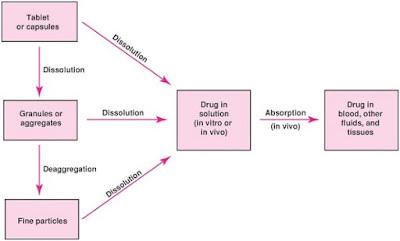 Dissolution is a kinetic process, the rate of dissolution reflects the amount of drug dissolved over a given time period. In certain cases, an equation can be exactly derived that describes the dissolution time dependence. Since drugs interact with optically active, asymmetric biological macromolecules such as proteins, polynucleotides, or glycolipids acting as receptors, many of them exhibit stereochemical specificity. This means that there is a difference in action between stereoisomers of the same compound, with one isomer showing pharmacological activity while the other is more or less inactive. Therefore, complementarity between an asymmetric drug and its asymmetric receptor is often a criterion of drug activity. The effects of highly active or highly specific drugs depend more upon such complementarity than do those of weakly active drugs. Occasionally, the stereo-selectivity of a drug is based on a specific and preferential metabolism of one isomer over the other, or on a bio-transformation that selectively removes one isomer. where KX is the dissociation constant of benzoic acid carrying substituent X; KH is the dissociation constant of unsubstituted benzoic acid. Electron-attracting substituents have a positive σ value, while electron-donating substituents (—OH, —OCH3, —NH2, —CH3) have a negative σ. The value of σ also varies according to whether the substituent is in the meta or para position. Ortho substituents are subject to too many interferences and are not used in calculating σ. The Hammet substituent constant includes both inductive and resonance effects (i.e., electronic influences mediated through space and through conjugated bonds). American Heart Association (AHA) and the American College of Cardiology (ACC) published the new guidelines related to high blood pressure. According to this guidelines, high blood pressure should be cured before lifestyle changes and some diseased patients with drug therapy at 130/80 mm Hg in place of 140/90 mm Hg. These guidelines published regarding the detection, management treatment and prevention of high blood pressure. Leading American Heart Association experts issued new guidelines for High blood pressure that means tens of millions more will meet the criteria for the condition, and will need to change their life styles or takes medication therapy to treat it.